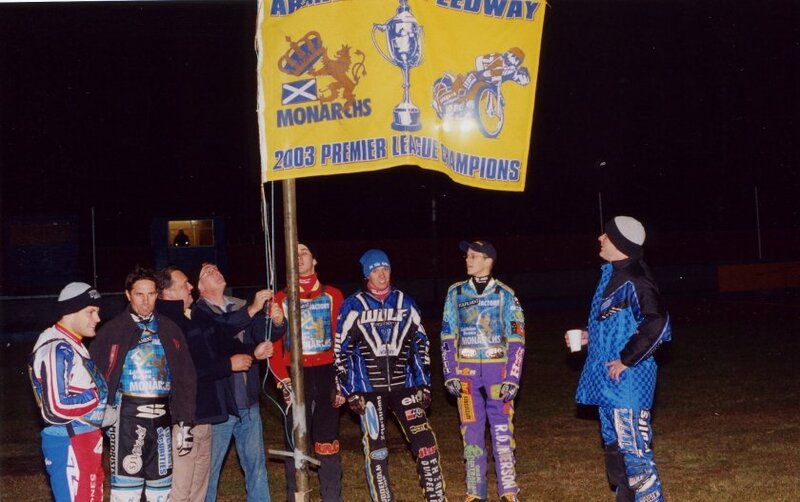 We had waited 55 years since the birth of the Monarchs to celebrate a league championship victory - but it happened in 2003. It was Frede Schott's vision that we should do this, with Frede himself at the top of the averages, and he made it happen with sterling assistance from Peter Carr, Rory Schlein, Magnus Karlsson, Theo Pijper, Wayne Carter and Mathew Wethers. All are in the photo other than Theo who had departed for a longtrack assignment. The flag-raiser was Derek Wilkinson though George Taylor is giving expert assistance.